The vast majority of these people have not read my original post, did not see comments on Facebook questioning her and have no idea what was said, except that she was criticised. They don’t even know what they are commenting on, a perfect example of the nature of the Wellness Warrior’s ‘tribe’. Why didn’t she link to the criticism she was responding to and let the people judge for themselves? If it is a matter of not wanting to send internet traffic my way there is always http://www.donotlink.com/ as a method of directing people to a website without their visit counting. Or is it a matter of not wanting followers to see the ugly truth? So much for the new found transparency. Now to the content of the blog post. Jess made several points in her post which I will address. I’m going to paraphrase but you can see the original by clicking here. 1. She is concerned that her target audience are being presented with a false account of the state of her health. She is often misquoted and other people make false conclusions about her condition. The people she accuses of misquoting her, or making false conclusions are doing so based on what she tells them and the impression she gives them. There has never been a clarification sighted on any of her own outlets when she has been ‘misquoted’, or a retraction/correction ever published where these ‘misquotes’ or ‘false accounts’ have appeared. She allows people to believe she has cured her cancer every time she doesn’t correct misquotes. Every time she doesn’t correct false conclusions. Every time she says there is something other than cancer wrong with her arm rather than ‘in addition to’. Every time she uses vague phrases like ‘I healed my body’. She has misrepresented her true situation by inference and lies of omission and is now blaming others for that. Jess has created a very public, profitable image and as such she needs to take responsibility for the clarity of her message. She needs to accept the fact that the public have the right to scrutinise her statements, claims and actions. In fact when it comes to the topic of health and cancer treatments the public has a responsibility to scrutinise. Crying foul on being called out in these circumstances is ridiculous. 2. She has faith that her body will completely heal once she has completely learnt the lesson that her cancer is here to teach. That is a lovely, comforting way to think and I’m sure it helps her sleep at night. But that is all it is, comforting thoughts. Nonsense. Cancer is a disease. A horrible, nasty disease that attacks indiscriminately, can sometimes be treated or cured and sometimes not. It takes people’s lives leaving their loved ones behind to grieve. It doesn’t want to teach lessons, it wants to kill. Sure, people can find lessons in their cancer experience but life lessons are not the purpose of cancer, nor will it magically go away if the right ones are learned. 3. She doesn’t claim Gerson Therapy cured her. What reasonable person would not think that meant she thought she was cured? And here, some examples of people who, due to the lack of clarity in her message thought she was cured. These people are her own fans and followers yet they didn’t realise she still has cancer. That isn’t the fault of anyone else but the messenger. 4. She doesn’t make money peddling a “cancer cure”. 5. She is not anti-doctors or anti-conventional medicine. “As regulars of this blog know, I am currently using the Gerson Therapy to recover from cancer. Dr. Max Gerson was far ahead of his time when it came to natural healing therapies. Known as the father of natural cancer cures, Dr. Gerson has given many tens of thousands of people the tools to cure their own cancers. I hate to think where patients like me would be if it hadn’t been for his knowledge, understanding and determination to make a difference to the poor state of the cancer industry. It’s kind of shocking to think that even though Dr. Gerson discovered his cure way back in the 1930s, many people have still never even heard of him – let alone know that his legacy holds the answers to curing cancer. After Dr. Gerson’s death, his daughter Charlotte made it her life’s purpose to keep her father’s dream alive. In this series of interviews, Mike Adams (aka the Health Ranger) of NaturalNews.com speaks to Charlotte Gerson about why the medical and drug industry do not want to find a cure for cancer and the history of mainstream oppression against cancer cures and leading anti-cancer doctors. This goes all the way back to the Nazis, IG Farben and the history of pharmaceutical companies like Bayer, which were implicated in the chemical torture of concentration camp prisoners. 6. Her beliefs and opinions have evolved over the years, so paying attention to anything she said in the past is being inaccurate. I think everyone’s beliefs and opinions evolve over time as they make their way through life, I know mine have. However, facts don’t change and Jess’ arm is still getting worse, no matter what she believes. This doesn’t absolve her from any responsibility for things she has said or claims she has made up to now. Or maybe it does? Given the quote pictured above in point 5 was from 2010, we better ignore it then. Right. As for ‘a loving note to my critics’, words like ‘onslaught’, ‘bullying’ and ‘attacks’ aren’t really loving, nor is suggesting all critics want to do was ‘condemn’ and are ‘disappointed not to find a conspiracy’. To say ‘ Try having a little compassion and kindness’ is to suggest that simply because someone questions, or disagrees with what she is doing that they lack compassion and kindness. I suggest that the only thing Jess knows about her critics is that they have criticised her. Thats a whole lot of negative judgement on a whole group of people for one loving note. Especially from someone affirming to replace judgement with kindness and compassion. Most of her critics simply want more transparency, which she admits she needs to increase. And finally, a blog post like that is exactly the reason people are scared to call her out. She took no time at all to play the victim card. Jess is responsible for the things she is being called out on and she needs to own that. I am truly sorry about her illness and the loss of her mum, but that doesn’t get her a free pass. You are not a victim here Jess, and out of respect and empathy for all those who have actually experienced bullying I refuse to let you apply the label ‘bully’ to me or any of your other critics. Save it for anyone who actually bullies you, the person, not those who criticise your message, your claims or your behaviour. That is not bullying, not even close. The Wellness Warrior: Denial, Delusion, or Dishonesty? I’ve been observing a young lady who goes by the title ‘The Wellness Warrior’ and calls herself a ‘Cancer Thriver’ for quite some time now and I’ve come to the point where I can no longer stay silent out of sympathy for her tragic situation. The reason for this; she is lying to herself, lying to her followers, lying to the public about her situation and deliberately hiding the truth of her condition. This can not continue, she is influencing people’s health and cancer treatment choices by misleading them. It is unconscionable. I will probably get slammed for speaking out about this but I don’t care, someone has to. Jessica Ainscough was diagnosed with Epithelioid Sarcoma in her left arm in 2008 at the age of 22. According to her own account of the story she had an isolated limb perfusion (high dose chemotherapy just to the arm), but was advised by her oncologist after relapse that amputation, although possibly not a cure, was her best option for survival or living a long life. Jess didn’t think this was an ‘attractive option’ and she decided against it and turned to the Internet looking for better options, which is where she found Gerson Therapy. 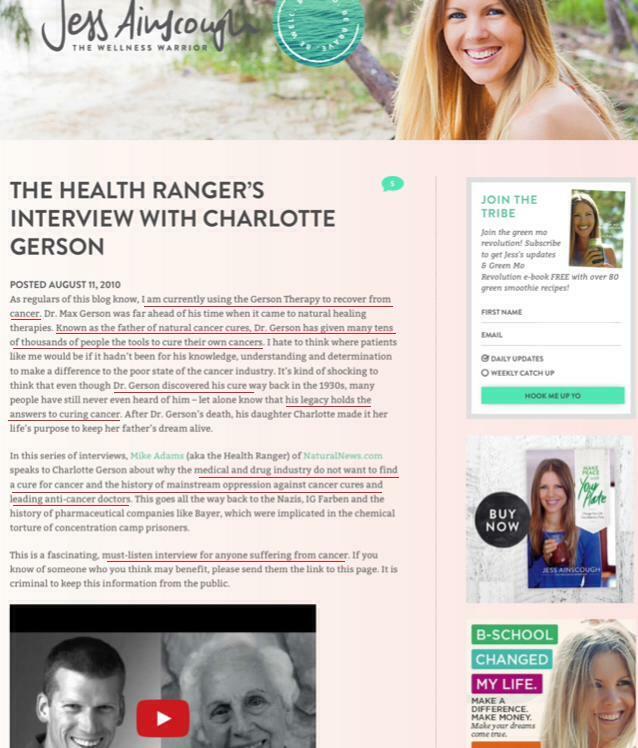 In short, Gerson Therapy is a cancer ‘cure’ scam that costs thousands of dollars and involves a restrictive diet and lifestyle of living on juices and doing up to five coffee enemas per day. You can see Jess demonstrating her method for doing the enemas here. A friend who works in oncology informs me that since Jess abandoned conventional therapy there has been huge advances in treatment. Newer targeted therapies have just about made isolated limb perfusion obsolete. Sadly for Jess, her adherence to Gerson Therapy and other nonsense for so long has almost certainly cost her any benefit she could have gained from the newer therapies. Epithelioid Sarcoma is a slow growing cancer. Without treatment, it has a 50-70% 5 year survival rate, and a 42-55% 10 year survival rate. Jess has been living with this cancer for 6 years now, so it is no surprise that she is still alive. In fact, it is almost expected that she would still be alive at this point. Her cancer is simply taking its natural course. There is no miracle here, no story of miraculous survival, and no ‘remission’ as she claims. Just normal disease progression. How do I know the disease is progressing as expected? By monitoring her endless stream of photographs. That is no easy task because she makes every effort to hide her diseased arm, behind other people, inside shirt sleeves, and more recently, inside a bandage, but I have seen enough to form an opinion on what is going on here. For instance, see this lovely photograph of a young beautiful, vibrant Jess in 2008. Her arm and hand look great. 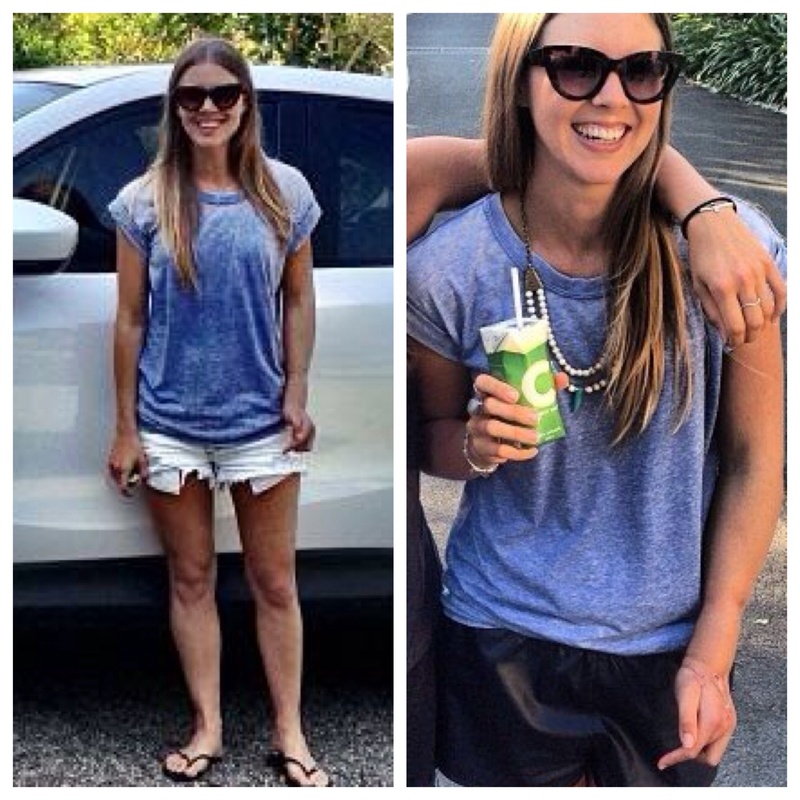 There is no denying she looks well, even healthy and there is no obvious sign of the cancer in her left arm. Fast forward to 2011, and here we can clearly see lesions on the outside of her left arm and hand, and underside of her left arm as well. And pictured here in 2013 Her arm started to look decidedly worse. No longer just lesions on her hand and arm, the arm is looking quite misshapen with the lesions turning into wounds. I’m told the medical term for this is fungating wounds. Despite the tragic loss of her mother to breast cancer in 2013 (she took the same ‘treatment’ path as Jess), she continues to promote Gerson Therapy as the reason for her own survival, with the caveat that ‘Like conventional treatment, it doesn’t work for everyone because every person, and every cancer is different.’ I can’t imagine what kind of mental and emotional gymnastics she has had to perform to be comfortable with the fact that her mother died following the very same protocol that Jess claims saved her. None of this has stopped Jess from turning her circumstances into a career. And by her own admission, a very lucrative career, but that is OK because money is energy after all. So Jess says she does not claim to have cured herself. She sure likes to give that impression though. Here in an online interview Jess allows the claim that she cured herself of cancer, naturally to stand. “You cured yourself of cancer, naturally. It’s a “stop the press” kind of moment, yet, because we find it so amazing, what does it say about our relationship with our bodies? And here we have a perfect example of the impression jess gives. Without actually saying ‘cured’ of course. Cancer free / cured. Tomato / tomato. I was also sent a private message by one of her handlers to say that she is consulting Doctors about her arm and it is a private matter. I’m sorry Jess, but everything you do and say publicly implies that you have cured yourself. Your wide eyed, adoring followers think you have cured yourself. I despair about how many people have chosen Gerson Therapy to ‘treat’ their (possibly otherwise treatable) cancer due to your wonderful, positive story. The elephant in the room here? Your left arm. If you are being so honest about your condition, why all the effort to hide the arm? Why haven’t your followers and fans been told about the problems with your arm? 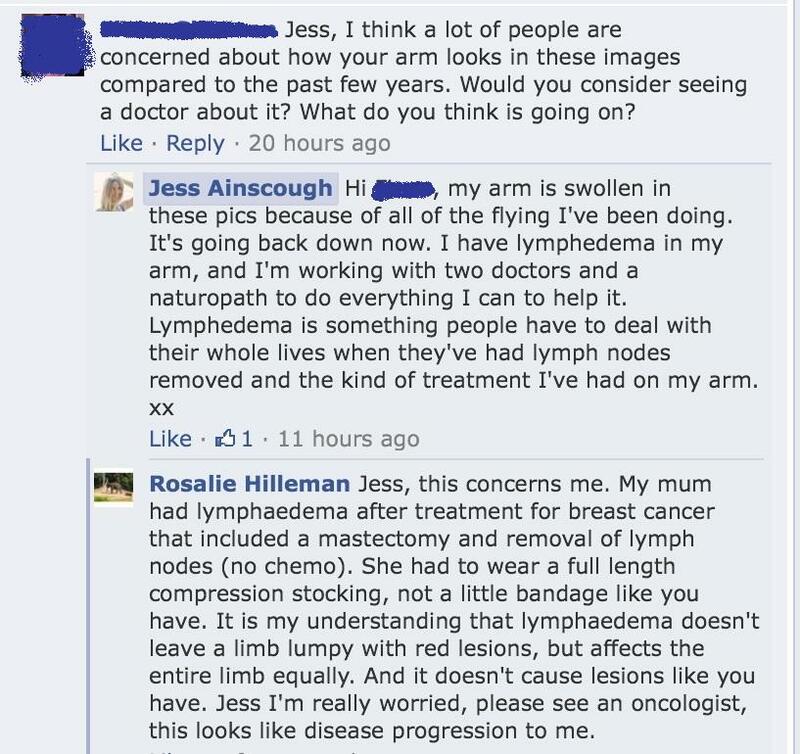 Why did you lie and say its just lymphedema from flying? When are you going to talk publicly about the state of your arm? You are being dishonest, by hiding the whole story. You are lying by omission. You are misleading people, for profit and adulation. Does her focus on making money from her new life eliminate any sense of decency she might have once had? I know what I think, but one thing is for sure – she has zero tolerance for any honest public dialogue about her condition, and doesn’t want her wide eyed believers to be exposed to it either. Over to you Jess, your move. Will you continue to mislead the very people who have contributed to your success? Or will honesty and human decency win out and see you speaking the real truth about your condition? And media. When is someone going to call her out and report on this situation for what it is instead of fawning over the beautiful young girl who drinks green smoothies? It is time someone in the media took a close look at this situation and exposed the cold hard facts. Edited to add: Jess has responded by writing a blog, which I will write a reply to over the next few days as time allows. Here is her response. 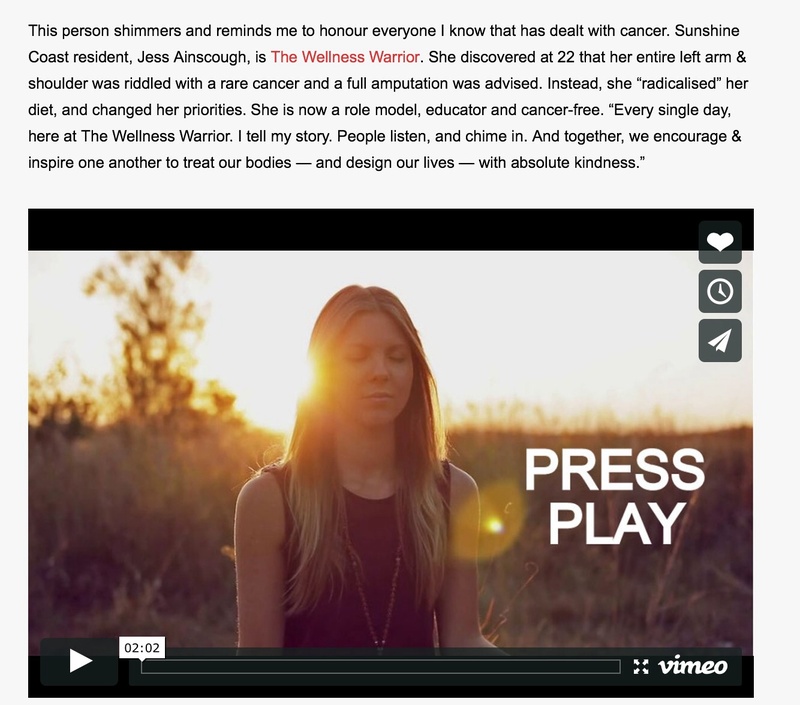 If you liked this post, you might like to see how Jess’ tribe responded when she passed away.